On the campus of Martin Methodist University athletic fields. Dual tees and dual permanent baskets. Water comes into play from both tees on #1 and 9 and to the long basket on #8. I-65; exit 14. Go west on US-64 for 7 miles to a right on TN-15/E College St. Go 1.7 miles to the college entrance on the right. 1st tee is near the upper left corner of the lot. 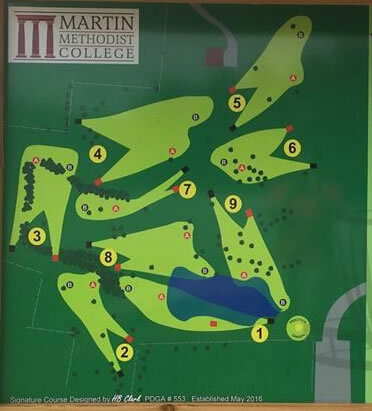 Have you played at Red Hawk Disc Golf at Martin Methodist College? Be the first person to review this course!